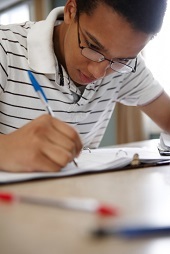 High school grades, test scores and extracurricular activities are extremely important, but the college application essay can make or break a student’s candidacy. Why? The essay is often the student’s only chance to “speak” directly to the admissions committee about why he or she should be admitted over possibly thousands of other applicants. An eye-catching college application essay demonstrates why the student is ideal and can be of value for that particular college or university. To benefit any students in your life, pass along this list of tips for writing an eye-catching college application essay. 1. Take your time writing the essay – For students planning to apply to many colleges, rushing through the college application essay can be tempting. Don’t rush. Instead, call upon the writing processes learned in school, including journal writing and free-style writing, and brainstorming your ideas. Let the essay take shape naturally and take time to review and contemplate your answers, rather than writing about the first thing that comes to mind. 2. Set yourself apart from others – College admissions committees receive numerous application essays about being the president of a student body council, or captain of a sports team, or editor of a yearbook, or other honors. Instead of focusing on the activity, focus on how you used the leadership position to expand or develop something, or spur or facilitate change, or help improve a program or people’s lives. If you had an unusual experience – such as teaching English in another country during the summer, or launching a successful online business, or working in your chosen field during vacations – that, too, can help you stand out from the crowd. 3. Tell or narrate a story – Demonstrate your character and creative skills by turning your college application essay into a story or feature story, told from the viewpoint of an observer or narrated in the third person. Both forms can be very compelling. Use descriptive writing techniques, such as active, snappy verbs and adjectives that paint a mental picture, to draw in the reader. Stay away from clichés, redundancy, unnecessary words, and long and tedious sentences. If you’re musically or poetically inclined, be aware of cadence as well. 4. Customize each essay – What you choose to share in your essay should depend primarily on the instructions and the college’s philosophy. Refer to the college’s website for an “About Us” or “Our Mission” webpage that could provide additional insights about the institution and what it cares about the most. If a college is particularly interested in community service, you might focus on your own community service experience. If a college is known for shaping future business leaders, you might write about your passions and plans for the future. 5. Don’t be repetitive – Often, applicants are asked to write several essays or to respond to several questions in essay form. When doing this, resist the urge to fall back on familiar themes already addressed in other parts of the application, such as your academic achievement or community service. Instead, explain how the various aspects of your life have shaped who you are and who you hope to become. 6. Don’t ramble – One of the biggest pitfalls of the collage application essay is the open-ended form. Remember that good essays begin with a thesis statement or by painting a theme, and include support. Support your ideas and comments with details, and close the loop by finishing each example or idea or argument before moving on to the next. The last sentence should tie in with the first sentence in one way or another, to show that you know how to make your thesis or theme hang together. 7. Be self-assured but not boastful – There’s a fine line between demonstrating confidence and bragging. When talking about yourself, it can be hard to walk the line between the two. Demonstrate your confidence by writing with ease and authority. Demonstrate your humility by writing with honesty and without self-praise. 8. Read your essay aloud – Is your essay boring? Does it have run-on sentences? Do you use appropriate words and correct grammar? One of the best ways to tell is to read your essay aloud to yourself, and/or a trusted friend or family member. The ear often catches mistakes that the eye glosses over, especially if you’ve been working on an essay for a long time. So, print out your essay, stand up, and read it aloud – you’ll be surprised by how many mistakes you find hidden in what you thought was perfect prose. 9. Ask for help – People in your life want to help you succeed, so let them. You may want to ask a smart older sibling, parent, high school English teacher, or counselor to review your college application essay before you submit it. 10. Proofread, proofread, proofread – Make sure that every college application essay that you write is polished by carefully proofreading it two or more times. Try printing the essay and reading it backward, in order to catch mistakes you might otherwise miss. Rely on your eye, not on computer spell-checkers or grammar-checkers.